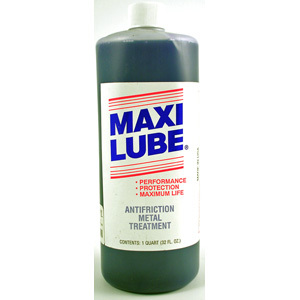 Maxilube ML32, 32 oz bottle, anti-friction metal treatment is 100% synthetic. It is non-hazardous and bio-degradable and contains no petroleum distillates. Maxilube is not an oil additive, it is a metal treatment. Once the metal is treated with MAXILUBE friction virtually disappears. The engine will run much cooler, quieter and cleaner with more power, less oil consumption and better mileage. Use with all Lubricants to reduce friction, heat and wear. Extends life, lowers operating temperatures, cuts oil and fuel consumption, increases power and reduces maintenance. In oils lighter than 80W, use 1-1/5-2 oz per quart. For oils and lubes 80W or heavier, use 3-4 oz per quart. In hydraulic fluids, use ½-1 oz / per quart. Mix 1 oz into each tube or pound of grease. 4 to 6 Cylinder Engines 8 oz. Treat at half the above rates when lubricants are added or changed. NOTE. This product is not a lubricant; do not substitute for oils. Do not use in Limited-Slip or Posi-Traction Differentials. Caution: Maxilube is non hazardous with normal use. In the event of eye contact, flush thoroughly with water for at least 15 minutes; get medical attention. For skin contact, wash with soap and water. Do not take internally. If swallowed, do not induce vomiting. Maxilube is a registered trademark.